Knights Landing Parent Participation Preschool - CooperationWorks! Cooperation is fundamental to Knights Landing Children’s Center. Community parents, the local elementary school, the school district, the local Family Resource Center, and current staff of the California Center for Cooperative Development worked together to make the Center’s 2005 opening a success. 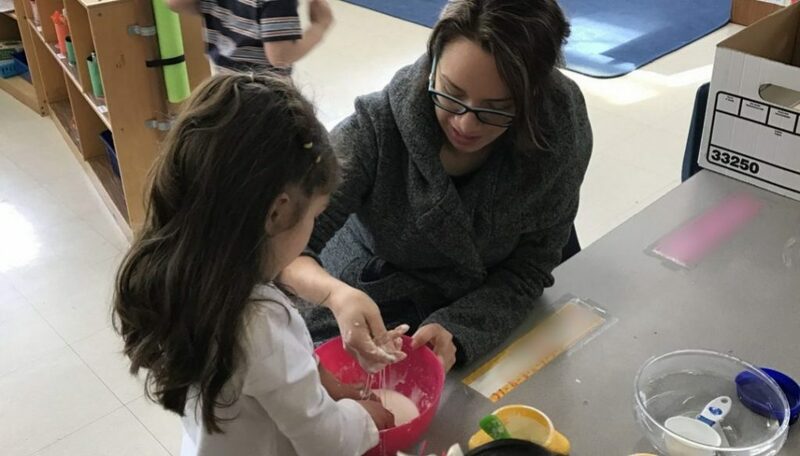 Today, the Parent Cooperative Center continues to provide quality child care and preschool experiences for community children ages two to six. Knights Landing Children’s Center (KLCC) meets the unique needs of families in the rural agricultural community of Knights Landing. Most of the parent members work in agricultural jobs. Many of the parent members speak only Spanish. The Center is the only child care center in the community, and is conveniently located in a classroom at Grafton Elementary School. Near the end of the school year last spring, the Grafton Elementary principal contacted KLCCdirector-teacher Clare Purtill to ask about the program because the standardized test scores for kindergarten and first graders who were co-op preschoolers were significantly higher than the school average. “I believe that parent involvement has a lot to do with those scores,” says Ms. Purtill. The nonprofit co-op is led by a board of parents who are elected by member parents. Each family is required to contribute five hours a month by either helping in the classroom or performing other functions that support the program. Every year parents must attend the annual membership meeting and a minimum of six education classes that focus on parenting issues. While KLCC has a strong program and many success stories to share, it struggles with funding issues. The center prides itself on its economic diversity, but the reality is that the income level of many member families is at or below the poverty level. KLCC staff are trained to help qualified families apply for public subsidies, however public funds are insufficient to meet the demand so families are often unable to obtain subsidies for which they qualify. In recognition of this problem, the co-op maintains a sliding fee scale that allows parents of modest means to pay significantly less tuition than those with higher incomes. This means that outside funding must be raised to fill the tuition gap. The California Center for Cooperative Development has offered ongoing assistance to Knights Landing Children’s Center since the founding of CCCD. Two years ago CCCD was awarded funding from USDA’s Rural Cooperative Development grant to provide technical assistance to the co-op. Since that time, student interns with CCCD have worked with CCCD staff and KLCC staff to identify funding sources, draft grant applications and prepare presentation materials. “CCCD has been an invaluable support to our co-op,” remarks Ms. Purtill. CCCD is actively helping KLCC to create sustainable strategies that will help the cooperative child care program endure.